Tour is the revolution and the evolution of a table with wheels. Again with wheels but, in this case, bicycle's wheels, transforming it in an amazing piece. Amazing and modern, Tour is an expression of freedom! 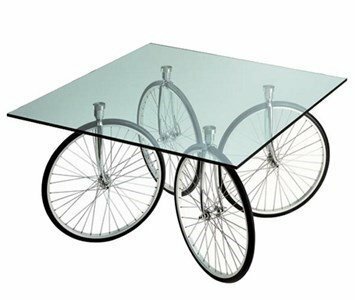 Aligning the 4 wheels, the table is ready to start its tour ... if the wheels are in different directions, the table remains in its place. 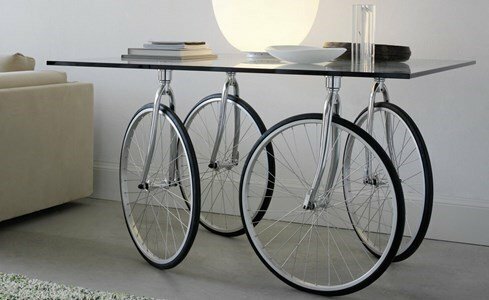 The beveled glass top with 15 mm thick, rests on four swivelling wheels connected to four stainless steel plates. The structure is chromed and the wheels are covered with rubber.